To Cite: Salehi A, Marzban M , Amini F. Effect of Foeniculum vulgare on Primary Dysmenorrhea: A Systematic Review and Meta-Analysis, Women Health Bull. Online ahead of Print ; 6(1):e74240. doi: 10.5812/whb.74240. Context: Dysmenorrhea is a common problem in women. Objectives: This study aimed to summarize the results of all relevant clinical trials to draw a conclusion regarding the effect of Foeniculum vulgare on primary dysmenorrhea (PD). Methods: In this study, we searched 19 databases (including Medline/PubMed, Scopus, ISI Web of Science) for the effects of Foeniculum vulgare on primary dysmenorrhea up to November 2016. The reference lists of the reviews and related articles were consulted to identify eligible articles. Studies investigating combinations of fennel and other products, without a control group, addressing premenstrual syndrome (PMS) and bleeding as the primary outcomes, and not being a randomized clinical trial (RCT) were excluded. A meta-analysis was performed to obtain a pooled estimate of effectiveness. The methodological quality was assessed using the modified Jadad scale. The registration number of this study is 95-01-65-11733. Results: Our search identified nine relevant articles for inclusion. The meta-analysis showed favorable effects of Foeniculum vulgare on primary dysmenorrhea for fixed effect (n = 727, OR = 0.573, 95% CI: 0.414 to 0.793, P = 0.001) and random effect (n = 727, OR = 0.141, 95% CI: 0.027 to 0.742, P = 0.021). The analysis also revealed a remarked heterogeneity (Q value = 198.318, P = 0.000, I2 = 95.96, τ2 = 6.065). Conclusions: We found that the fennel extract is effective for primary dysmenorrhea. However, due to the heterogeneity of various findings, we were unable to find the effective dosage and concentration of this herbal medicine. We recommend multicenter clinical trials worldwide for evaluating the effectiveness of fennel in primary dysmenorrhea. Dysmenorrhea is a common gynecological complaint among women of reproductive age (1). Approximately, 50% of women report dysmenorrhea during menstruation periods in early adulthood (2). Annually, workplace absence due to dysmenorrhea accounts for 600 million work hours and amounts to about 2 billion dollars’ loss (2). Primary dysmenorrhea is a medical condition associated with cramping pain in lower abdomen during menstruation periods without any pelvic pathology while secondary dysmenorrhea is associated with basic pathological conditions in the pelvis (3, 4). Primary dysmenorrhea starts a few hours before menstrual bleeding or immediately after bleeding (5). Although the exact mechanism of this problem has not been defined clearly (3), myometrium contraction due to the secretion of prostaglandins has been suggested as a possible mechanism. Three approaches may be adopted for treatment: pharmacological, non-pharmacological, and surgical (6). Commonly used drugs include non-steroidal anti-inflammatory drugs (NSAIDs) and oral contraceptive pills (OCP). Herbs have been used to manage this problem, but there is insufficient evidence of the efficacy of herbal remedies for treating primary dysmenorrhea (7, 8). On the other side, other complementary and alternative medicines are used for treating dysmenorrhea (9, 10). In traditional Persian medical books, fennel (Foeniculum vulgare) is recommended for starting menstruation period and pain relief. In addition, recent research has demonstrated that Foeniculum vulgare can be effective for primary dysmenorrhea and with only a few transient adverse effects (2, 5, 11, 12). However, as these studies have not depicted definite results and effects, more research should be considered; in particular, systematic reviews and meta-analyses must be conducted to determine the efficacy of fennel in primary dysmenorrhea. So far, only one systematic review by Satches et al. has studied the effectiveness of fennel in primary dysmenorrhea (13); however, their article is written in Dutch, not in English, and their review is limited to some published papers and not all studies. In addition, that study did not include a meta-analysis. Due to the high prevalence of dysmenorrhea in large numbers of women, finding new ways to cope with this problem is highly important for many individuals and clinicians. The aim of this systematic review is to summarize the results of all relevant clinical trials to draw a conclusion regarding the effects of Foeniculum vulgare, as an alternative treatment, on primary dysmenorrhea. First, a protocol was written by the authors and a guideline was prepared so that every step was completed according to the protocol. Patients included people who had primary dysmenorrhea with a mean age between 15 and 25 (young women). The interventions included capsule or drop of fennel that was used in the first day or before the menstruation period for reducing the pain of the population. Two reviewers (F.A and M.M) independently scanned the titles of all retrieved articles, removed duplicates, and identified potentially relevant abstracts for further assessment. The selected abstracts were independently reviewed by two researchers for further evaluation of relevancy and refinement. In case of a disagreement between the reviewers, a third researcher (A.S) acted as the mediator. We searched for articles evaluating the effects of fennel on dysmenorrhea or comparing fennel with other drugs such as NSAIDs, Vitamin E, or other herbal drugs in terms of their effect on dysmenorrhea. Due to the high consumption of fennel in Iran as a traditional medicine, we decided to search English and Persian language articles published until November 2016. The researchers searched Medline/PubMed, Scopus, ISI Web of Science, ScienceDirect, Embase, Cochrane Library, ProQuest, CINAHL, DOAJ, OVID, Wiley, EBSCO, and Google Scholar databases for international papers. Four Iranian databases, namely SID, MagIran, IranMedex, and Irandoc were also searched for Persian articles. The search covered articles published up to November 2016. The keywords included [“Foeniculum vulgare” or “fennel” or “badian”] and [“dysmenorrheal” or “dysmenorrhea” or “painful periods” or “menstrual cramps”]. In addition, the Persian word for fennel (Raziyaneh) was searched in Iranian databases. The results were imported into an EndNote X7 library and the duplicates were automatically removed. In addition, we manually searched reference lists of reviews for articles and conference proceedings. Hard copies of all articles were also consulted in full. The review covered articles, in English and Persian, in addition to dissertations and abstracts. Among 1387 records identified through database searching and 91 additional records identified through other sources, we excluded 384 records after duplicates were removed in the initial screening. The inclusion criteria included being a human study, having a control group, and investigating the effect on PD. On the other hand, many articles were excluded for different reasons such as using combinations of fennel and other chemical drugs and herbs (14, 15), evaluating the effects of fennel on animals (animal studies), not including a control group for comparison, addressing premenstrual syndrome (PMS), not being a randomized clinical trial, or being retrospective. After identification and the first stage of screening, only 23 articles remained that were then assessed for eligibility. In this stage, 13 more articles were excluded due to some other reasons such as being review articles investigating fennel as herbs (16-21), being published in two languages (Persian and English) at the same time (22, 23), or having a different scale for measurement (5). Therefore, 10 articles were eventually included in the qualitative synthesis. We used the Jadad scale to assess independently the methodological quality of a clinical trial. In this stage, we used the Jadad scale with the score ranging from 0 to 5. One study was excluded in this stage due to its low quality according to the Jadad scale (22), the minimum score for this study was 3 out of 5 (Table 1). Figure 1 represents the flow chart for the exclusion of articles. For extracting the data from articles, we used a form and a checklist independently by each author; then, the authors double checked the data with each other. aPlus (+) means articles gave this score and minus (-) means articles could not give this score. The effect of fennel on dysmenorrhea was expressed as the mean change in pain intensity. Due to the heterogeneity in presenting the effect size, we changed all of them to odds ratios (OR) by using the comprehensive meta-analysis software CMA (Version 2.2.064 for Windows). For better rational expression and significance, we determined 95% confidence intervals (CIs) for each OR of study and entered data into the software. In order to provide a better understanding, we converted every effect size to odds ratio and reported the summary measure in this format. In addition, we entered the comparison group and time of follow-up as modifiers in the software and considered them in the subgroup analysis. The Q test, τ2, and I2 test were used to assess heterogeneity. 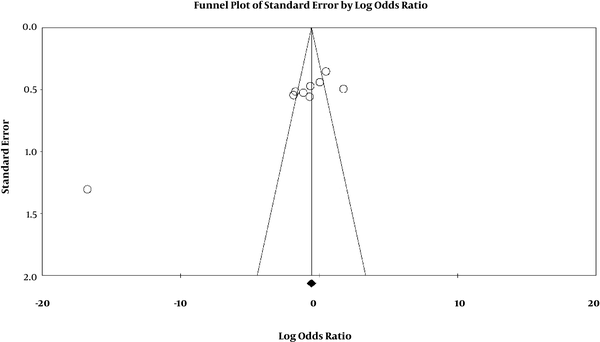 A funnel plot was used to check the publication bias. When there is no publication bias, high precision studies will be plotted close to the average and while low precision studies are evenly spread on both sides, it will give rise to a roughly funnel-shaped distribution. Any deviation from this shape may indicate a publication bias (Figure 2) (29). There were totally 727 samples in the nine articles included in our review. All studies were conducted in Iran from 2003 to 2014; five were published in Persian (22-24, 26, 29) and four were published in English (2, 11, 25, 27). The control treatment included conventional treatment, herbal intervention, and placebo. The type of intervention varied from the capsule to drop and the duration of treatment varied between participants. The minimum and maximum mean age of the participants was 15.5 and 25.1 years, respectively. The menarche age ranged from 13 to 14.11 years. Most studies started their intervention on the first day of the menstrual period, but the time of follow-up varied between studies from before the intervention to two months after the intervention (Table 2). Five out of nine studies showed a significant relationship between dysmenorrhea and using fennel. All of the significant associations showed a positive effect for fennel on dysmenorrhea except for one study that showed an inverse relationship (1). The meta-analysis showed the favorable effect of consumption of fennel on dysmenorrhea pain. As shown in Figure 3, a significant effect was found in both fixed effect (n = 727, OR = 0.573, 95% CI: 0.414 to 0.793, P = 0.001) and random effect (n = 727, OR = 0.141, 95% CI: 0.027 to 0.742, P = 0.021) models. The analysis also revealed a remarked heterogeneity (Q value = 198.318, P = 0.000, I2 = 95.96, τ2 = 6.065). We considered the follow-up time and different types of intervention in the subgroup analysis, but we could not find any significant trend or a prominent effect in these models. In this study, we found that the fennel extract is effective for primary dysmenorrhea; however, due to the heterogeneity of various findings, we were unable to find the effective dosage and concentration of this herbal medicine. In addition, the duration of the treatment and the time of follow-up varied between different studies, making it impossible to find the precise time of potency of this herbal medicine. Nowadays, medicinal herbs constitute good alternatives to chemical drugs; one of the major reasons is their fewer side effects compared to chemical drugs. In addition, their antioxidant properties may reduce the toxicity of drugs. Fennel has been used for thousands of years for treating primary dysmenorrhea, facilitating birth, and increasing sexual desire (30, 31). Primary dysmenorrhea imposes a high burden, social problems, and economic costs on women worldwide and it is the leading cause of absenteeism from school (32). Various treatments are available for primary dysmenorrhea, including oral contraceptive pills (33), NSAIDs (34) surgical treatment (35), prostaglandin synthetase inhibitors (PGSis) (36), transcutaneous electrical nerve stimulation (TENS), and vitamin D and E (37), as well as herbal medicines like ginger (38), Rosa Damascena (39), peppermint (40), vitagnus (41), and particularly fennel, which is frequently used by women. According to the one herbal drug review with acceptable and valid methodology conducted in Iran, fennel was the most effective herb for treating primary dysmenorrhea; moreover, it was more effective compared to other herbal drugs. Although the evidence shows that fennel is effective for primary dysmenorrhea, the effective dose and duration of treatment with this herbal drug need to be determined. Based on previous research, it is known that moderate doses of fennel increase mammary gland weight and higher doses increase the weight of oviduct, endometrium, myometrium, and cervix (42). In addition, previous studies show that the fennel extract may be effective for primary dysmenorrhea at a concentration of 1% to 2% (11). A study by Namavar Jahromi et al. demonstrated that at 2% concentration with the dosage of 25 drops q4h, the fennel extract might have lower potency compared to mefenamic acid (11). In addition, Torkzahrani reported that fennel extract is more effective in comparison with the essence, as the extract is derived from the seed (28). However, other studies have not discussed the effective dose and type of fennel product for treating primary dysmenorrhea. Although the effects of fennel have been evaluated in animal studies, the review shows the mechanisms of fennel in primary dysmenorrhea, and a sufficient number of clinical trial studies have been conducted in Iran; however, this drug cannot be introduced in the world yet. We attempted to perform a systematic review and meta-analysis with high quality and excluded some studies due to their low Jadad score. Previously, one review study has been published to investigate the effects of fennel on primary dysmenorrhea. Nevertheless, that study, which was not published in English, has a very important limitation since the authors could not include certain relevant studies due to language constraints (43). Consequently, our findings may introduce a novel treatment to gynecologists although further studies are necessary to determine the effective dose and duration of treatment as two important components for clinical use. An important limitation of this study is the heterogeneity of the results. Although the funnel charts showed the absence of bias and between-study heterogeneity, the scatter will be due to sampling variation alone; furthermore, the heterogeneity index shows a prominent heterogeneity between studies. In addition, we were unable to evaluate confounding factors such as family history (32), stress and depression (44), caffeine (34), body mass index (45), or abortion (46) although two confounding variables of mean age and menarche age were the same across several studies. Primary dysmenorrhea remains one of the most important problems for women around the world and its burden is known among various nations. Although the prominent effect of fennel is known for treating primary dysmenorrhea, it is not extensively used for this purpose, and we could not find any study conducted in countries other than Iran until this time; this can be due to various reasons; for example, one study showed that more than 73.5% of Iranian female used herbal drug for different reasons (47). Also, in Iranian traditional medicine, we use Raziyaneh for primary dysmenorrhea (30). We suggest multicenter clinical trials around the world for evaluating the effectiveness of fennel in primary dysmenorrhea and finding the appropriate dose and duration of this treatment with adjustments for various confounding factors. This herb may then be recommended to gynecologists for treating primary dysmenorrhea as a prevalent complaint of women during their menstrual periods. Funding/Support: Research Center for Traditional Medicine and History of Medicine, Shiraz University of Medical Sciences, Shiraz, Iran. 1. Harlow SD, Park M. A longitudinal study of risk factors for the occurrence, duration and severity of menstrual cramps in a cohort of college women. Brit J Obstet Gynaec. 1996;103(11):1134-42. doi: 10.1111/j.1471-0528.1996.tb09597.x. 2. Omidvar S, Esmailzadeh S, Baradaran M, Basirat Z. Effect of fennel on pain intensity in dysmenorrhoea: A placebo-controlled trial. Int Q J Res Ayurveda. 2012;33(2):311-3. doi: 10.4103/0974-8520.105259. [PubMed: 23559811]. [PubMed Central: PMC3611645]. 3. Burkman RT. Berek and Novak’s Gynecology. J Am Med Assoc. 2012;308(5):516. doi: 10.1001/jama.308.5.516. 4. Yesuf TA, Eshete NA, Sisay EA. Dysmenorrhea among University Health Science Students, Northern Ethiopia: Impact and associated factors. Int J Reprod Med. 2018;2018:9730328. doi: 10.1155/2018/9730328. [PubMed: 29610764]. [PubMed Central: PMC5828460]. 5. Ghodsi Z, Asltoghiri M. The effect of fennel on pain quality, symptoms, and menstrual duration in primary dysmenorrhea. J Pediatr Adolesc Gynecol. 2014;27(5):283-6. doi: 10.1016/j.jpag.2013.12.003. [PubMed: 25085020]. 6. Larkin RM, Van Orden DE, Poulson AM, Scott JR. Dysmenorrhea: Treatment with an antiprostaglandin. Obstet Gynecol. 1979;54(4):456-60. [PubMed: 492626]. 7. Kotani N, Oyama T, Sakai I, Hashimoto H, Muraoka M, Ogawa Y, et al. Analgesic effect of a herbal medicine for treatment of primary dysmenorrhea-a double-blind study. Am J Chin Med. 1997;25(2):205-12. doi: 10.1142/S0192415X9700024X. [PubMed: 9288368]. 8. 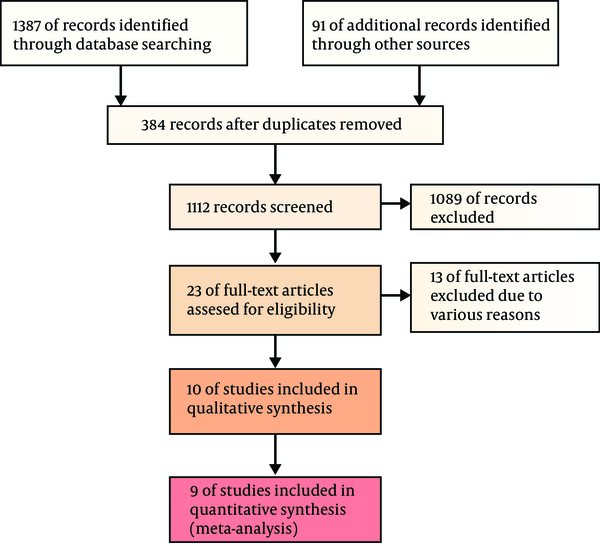 Pellow J, Nienhuis C. Medicinal plants for primary dysmenorrhoea: A systematic review. Complement Ther Med. 2018;37:13-26. doi: 10.1016/j.ctim.2018.01.001. [PubMed: 29609924]. 9. Shetty GB, Shetty B, Mooventhan A. Efficacy of acupuncture in the management of primary dysmenorrhea: A randomized controlled trial. J Acupunct Meridian Stud. 2018;11(4):153-8. doi: 10.1016/j.jams.2018.04.001. [PubMed: 29654840]. 10. Song JA, Lee MK, Min E, Kim ME, Fike G, Hur MH. Effects of aromatherapy on dysmenorrhea: A systematic review and meta-analysis. Int J Nurs Stud. 2018;84:1-11. doi: 10.1016/j.ijnurstu.2018.01.016. [PubMed: 29729556]. 11. Namavar Jahromi B, Tartifizadeh A, Khabnadideh S. Comparison of fennel and mefenamic acid for the treatment of primary dysmenorrhea. Int J Gynecology Obstetrics. 2003;80(2):153-7. doi: 10.1016/s0020-7292(02)00372-7. 12. Moslemi L, Aghamohammadi A, BeKhradi R, Zafari M. [The comparison of vitamin E and fennel extract effects on duration of pain in primary dysmenorrheal]. J Knowl Hlth. 2012;7(2):61-4. Persian. 13. Zhang WY, Li Wan Po A. Efficacy of minor analgesics in primary dysmenorrhoea: A systematic review. Br J Obstet Gynaecol. 1998;105(7):780-9. [PubMed: 9692420]. 14. Nasehi M, Sehhatie F, Zamanzadeh V, Delazar A, Javadzadeh Y, Chongheralu BM. Comparison of the effectiveness of combination of fennel extract/vitamin E with ibuprofen on the pain intensity in students with primary dysmenorrhea. Iran J Nurs Midwifery Res. 2013;18(5):355-9. [PubMed: 24403936]. [PubMed Central: PMC3877456]. 15. Moslemi L, Bekhradi R, Moghaddam G. Comparative effect of fennel extract on the intensity of primary dysmenorrhea. Afr J Pharm Pharmaco. 2012;6(24):1770-3. doi: 10.5897/AJPP12.356. 16. Dadkhah N, Eskandarian R, Rahimi-Madiseh M. The medicinal plants and plant-based products of Iran effective on dysmenorrheal. Int J PharmTech Res. 2016;9(5):392-406. 17. Gholami Z. Pnm-6: The primary dysmenorrhea and complementary medicine in Iran: A systematic review. Int J Fertil Steril. 2015;9((2.5)). doi: 10.22074/ijfs.2015.4504. 18. Jia W, Wang X, Xu D, Zhao A, Zhang Y. Common traditional Chinese medicinal herbs for dysmenorrhea. Phytother Res. 2006;20(10):819-24. doi: 10.1002/ptr.1905. [PubMed: 16835873]. 19. Pattanittum P, Kunyanone N, Brown J, Sangkomkamhang US, Barnes J, Seyfoddin V, et al. Dietary supplements for dysmenorrhoea. Cochrane Database Syst Rev. 2016;3. doi: 10.1002/14651858.CD002124.pub2. [PubMed: 27000311]. 20. Sae Ghare Naz M, Azgoli G. [Effects of herbal medicines used for treating primary dysmenorrhea in Iran: A review study]. Iranian J Obstet Gynecol Infertil. 2015;18(160):14-31. Persian. 21. Zhu X, Proctor M, Bensoussan A, Wu E, Smith CA. Chinese herbal medicine for primary dysmenorrhoea. Cochrane Db Syst Rev. 2008. doi: 10.1002/14651858.CD005288.pub3. 22. Modares Nejad VMB, Asadi Pour M. [Comparing the effect of oral fennel and mefenamic acid in relieving primary dysmenorrhea]. J Rafsanjan Univ Med Sci. 2006;5(1):1-6. Persian. 23. Moslemi LAA, Bekhradi R, Zafari M. [Comparing the effects of fennel extract and vitamin E on severity of primary dysmenorrhea]. Mazandaran Univ Med Sci J. 2011;22(88):103-7. Persian. 24. Nazarpour SAH. [Investigating the effect of fennel (Foeniculum vulgare) extract on primary dysmenorrhea]. Mazandaran Univ Med Sci J. 2007;17(16):54-61. Persian. 25. Modaress Nejad V, Asadipour M. Comparison of the effectiveness of fennel and mefenamic acid on pain intensity in dysmenorrhoea. E Mediterr Health J. 2006;12((3-4)):423-7. [PubMed: 17037712]. 26. Delaram M, Forouzandeh N. [Effects of fennel on primary dysmenorrhea in students residing in dormitories of Shahre-Kord University of Medical Sciences]. J Hamedan Univ Med Sci. 2011;18(1):42-7. Persian. 27. Zeraati F, Shobeiri F, Nazari M, Araghchian M, Bekhradi R. Comparative evaluation of the efficacy of herbal drugs (fennelin and vitagnus) and mefenamic acid in the treatment of primary dysmenorrhea. Iran J Nurs Midwifery Res. 2014;19(6):581-4. [PubMed: 25558254]. [PubMed Central: PMC4280721]. 28. Torkzahrani S, Akhavan-A M, Mojab F, Alavimajd H. The effect of Foeniculum vulgare on primary dysmenorhea. J Reprod Infertility. 2007;8(1):45-51. 29. Delaram MFN. [Comparing the effects of fennelin and mefenamic acid on primary dysmenorrhea]. J Jondishapour Univ Med Sci. 2010;10(1):81-8. Persian. 30. Khorshidi N, Ostad SN, Mosaddegh M, Soodi M. Clinical effects of fennel essential oil on primary dysmenorrhea. Iran J Pharm Res. 2003;2(2):89-93. 31. Ostad SN, Soodi M, Shariffzadeh M, Khorshidi N, Marzban H. The effect of fennel essential oil on uterine contraction as a model for dysmenorrhea, pharmacology and toxicology study. J Ethnopharmacol. 2001;76(3):299-304. [PubMed: 11448553]. 32. Durain D. Primary dysmenorrhea: Assessment and management update. J Midwifery Women Hlth. 2004;49(6):520-8. doi: 10.1016/s1526-9523(04)00390-3. 33. Harada T, Momoeda M, Taketani Y, Hoshiai H, Terakawa N. Low-dose oral contraceptive pill for dysmenorrhea associated with endometriosis: A placebo-controlled, double-blind, randomized trial. Fertil Steril. 2008;90(5):1583-8. doi: 10.1016/j.fertnstert.2007.08.051. [PubMed: 18164001]. 34. Hillen TI, Grbavac SL, Johnston PJ, Straton JA, Keogh JM. Primary dysmenorrhea in young Western Australian women: Prevalence, impact, and knowledge of treatment. J Adolesc Health. 1999;25(1):40-5. [PubMed: 10418884]. 35. Lefebvre G, Pinsonneault O, Antao V, Black A, Burnett M, Feldman K. Primary dysmenorrhea consensus guideline. J Obstet Gynaecol Canada. 2005;27(12):1117-30. doi: 10.1016/s1701-2163(16)30395-4. 36. Owen PR. Prostaglandin synthetase inhibitors in the treatment of primary dysmenorrhea. Outcome trials reviewed. Am J Obstet Gynecol. 1984;148(1):96-103. [PubMed: 6419611]. 37. Deutch B, Jørgensen EB, Hansen JC. Menstrual discomfort in Danish women reduced by dietary supplements of omega-3 PUFA and B12 (fish oil or seal oil capsules). Nutr Res. 2000;20(5):621-31. doi: 10.1016/s0271-5317(00)00152-4. 38. Ozgoli G, Goli M, Moattar F. Comparison of effects of ginger, mefenamic acid, and ibuprofen on pain in women with primary dysmenorrhea. J Altern Complement Med. 2009;15(2):129-32. doi: 10.1089/acm.2008.0311. [PubMed: 19216660]. 39. El-Magboub A, Garcia C, James Jr AD. A revival of primary healing hypotheses: Acomparison of traditional healing approaches of Arabs and American Indians. Tang [Humanitas Medicine]. 2012;2(1):4.1-4.13. doi: 10.5667/tang.2011.0025. 40. Han SH, Hur MH, Buckle J, Choi J, Lee MS. Effect of aromatherapy on symptoms of dysmenorrhea in college students: A randomized placebo-controlled clinical trial. J Altern Complement Med. 2006;12(6):535-41. doi: 10.1089/acm.2006.12.535. [PubMed: 16884344]. 41. Shobeiri F, Zeraati F, Mansouri Z, Araghchian M, Nazari M. The comparative effect of herbal extract of vitagnus and mefenamic acid on primary dysmenorrhea. Zahedan J Res Med Sci. 2012;14(5):30-3. 42. Malini T, Vanithakumari G, Megala N, Anusya S, Devi K, Elango V. Effect of foeniculum vulgare mill. Seed extract on the genital organs of male and female rats. Indian J Physiol Pharmacol. 1985;29(1):21-6. [PubMed: 4055014]. 43. Sachse C, Uehleke B. Systematischer review zur wirksamkeit von fenchel bei primarer dysmenorrho. Z Phytotherapie. 2015;36(4):150-6. German. doi: 10.1055/s-0041-104839. 44. Silberg JL, Martin NG, Heath AC. Genetic and environmental factors in primary dysmenorrhea and its relationship to anxiety, depression, and neuroticism. Behav Genet. 1987;17(4):363-83. [PubMed: 3675527]. 45. Baker FC, Driver HS, Rogers GG, Paiker J, Mitchell D. High nocturnal body temperatures and disturbed sleep in women with primary dysmenorrhea. Am J Physiol. 1999;277(6):E1013-21. doi: 10.1152/ajpendo.1999.277.6.E1013. [PubMed: 10600789]. 46. Grandi G, Ferrari S, Xholli A, Cannoletta M, Palma F, Romani C, et al. Prevalence of menstrual pain in young women: What is dysmenorrhea? J Pain Res. 2012;5:169-74. doi: 10.2147/JPR.S30602. [PubMed: 22792003]. [PubMed Central: PMC3392715]. 47. Ameri F, Vahabi M, Khatoonabadi S, Andalibi L. [The relevance of medicinal plants consumers in Iran: Investigating statistics for consumers, states of consumption, informative and source area]. J Teb Va Tazkieh. 2013;22(3):37-42. Persian.